Cotton fabric has many uses in sewing and makes lovely cushion covers. Cotton fabric - is one of natures natural fibres, the others being wool, linen and silk. These fibres grow on a plant as a flower similar to a Hollyhock. The flowers come in red, white or yellow and when these die the seed pod opens to show the white hairy down. The long hairs that cover the seeds look like fine wool and these have to be separated from the seeds to make the material. Years ago this was done by people until a special machine called a "gin" was developed to do this and made this process quicker. This was an important material and has been around for many centuries. The Indus valley and Peru were the places that this fibre was first used. Gradually other places around the world began to grow it as well like the Persian Gulf, Egypt, China, India, North America, and Australia. There are many varieties and those grown in one country will not grow properly in others as the temperature and humidity all play a part. This fabric was not grown in Britain, but this country had a thriving cotton industry with many cotton mills in Lancashire. Manufacturing inventions such as "The Spinning Jenny" by Hargreaves, the "Mule" by Crompton and the power loom by Cartwright changed the way it was produced and the cotton mills in Lancashire were born. Before the fibres can be turned into cloth they have to be spun together to make long threads either by hand or machine. These threads are then woven on a loom to get the final fabric. This fabric is ideal material for clothes and cushion making as it is hard wearing and washes well, although it may shrink. Because of this it is probably best to pre wash the fabric before anything is made. 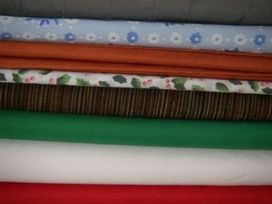 It is also a good fabric for making bunting and using in patchwork. It also creases when in the pure form and may be difficult to iron. But mixes well with synthetic fabric fibres like polyester and this tends to reduce the creasing. This comes in a variety of different colours and weights. There is a wonderful choice of plain and patterned material to please most tastes. The types of material with this fabric base are Brocade, Corduroy, Calico, Chintz, Damask, Gingham and Lace. It is best to use a good quality fabric as cushions may need to be hard wearing, however if the cushion is only for decoration, as on a bed, then finer fabric can be used. It is always worth thinking where the cushions are going to be placed so that you can decide how strong the fabric should be. I personally feel that any weight can be used for cushion covers as the lighter ones can always be lined for extra strength. Laura Ashley has got lots of lovely material for the home and also some ready made cushions and throws. Enjoy choosing your lovely cotton fabric for your creations.